Have you ever written out a commissary shopping list, only to get to the store and realize you've forgotten it? With MyMilitarySavings.com's digital shopping list and a smart phone, you'll never have to worry about leaving home without your grocery list again. Why? As part of your free membership to MyMilitarySavings.com, you'll have access to "My Shopping List," a proprietary app that allows you to add items you need to a digital grocery list, and then keeps track of any coupons you've clipped on our site by automatically matching up those coupons to the items on your list. Go to MyMilitarySavings.com and find the "My Shopping List" tab at the top right of your screen. Click on the tab and find the product category you're looking for. For example, if you need diapers, click "Baby items" and all baby items that are on sale will appear. Add the items you want to purchase to your commissary shopping list, then go to the next item. You can also add items that aren't on sale to your list. When you're finished, just click "saved" and your completed shopping list will be accessible via your smart phone when you're ready to shop. You also have the option of printing your shopping list from the website in case you need a paper copy. The convenient commissary shopping list app is just one benefit of joining our easy-to-use website. We understand that military life, especially for families who move from location to location, isn't just about saving money on groceries – it can also be a stressful time. That's why MyMilitarySavings.com offers more than just commissary coupons and military discounts. We make it easy to connect with others through our lively online community, which offers useful information, time-saving tips, members-only contests, and mouth-watering recipes. Plus, we have an active virtual community on Facebook, where you can find new friends and even join our member book club. 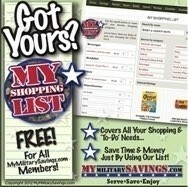 Join MyMilitarySavings.com today to take advantage of your free commissary shopping list and learn about the many other useful tools that can help you save time and money.